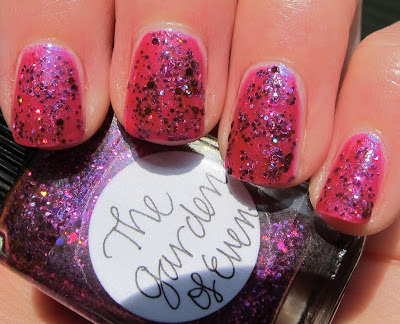 Never Enough Nails: Lynnderella The Garden of Even NOTD, plus options! 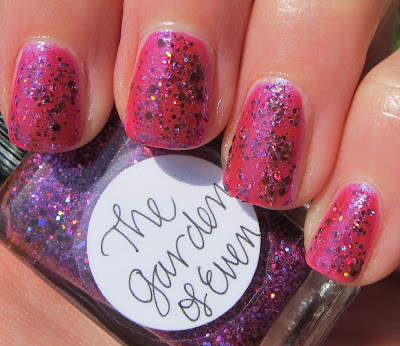 Lynnderella The Garden of Even NOTD, plus options! I've been wearing this Lynndercombo for about 6 days now and I'm still in love with it. 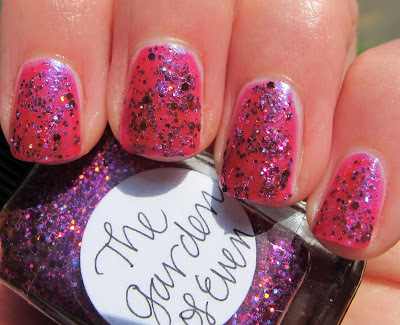 This beauty is Lynnderella The Garden of Even from the Sweet Somethings for a Summer Solstice collection, and I've layered it over China Glaze Reggae to Riches. I am not sure I can accurately describe the gorgeousness that is The Garden of Even, so I'm going to share Lynn's description with you. She says, "The Garden of Even is a magical place where the holographic magenta roses bloom for eleven months a year. The gardener is not your average goddess—she is Venus in a froth of a silk slip. Sheer pink base with bleeding glitter. " I love her poetic descriptions!! I also love how the holographic glitter does bloom out of the pink base!! My camera was a little blinded by the holographic light, so it didn't really capture all of the holo-ness. In the above macro, you can see maybe four or five holo glitter pieces, but in reality, MANY more of those pieces were holo glitter. It's really blinding (in an awesome way) in person! The Garden of Even was very easy to apply. I just applied it like a normal polish, no dabbing method or anything. This is two coats over two coats of Reggae to Riches. Before I settled on Reggae to Riches, I did some skittles to try to pick my base, so I thought it would be helpful to share that picture as well. This was just a fast job, so excuse the lack of good application. You can see that the base of GoE is definitely pigmented enough to wear all alone. It looks very nice that way and I'll probably wear it alone next! 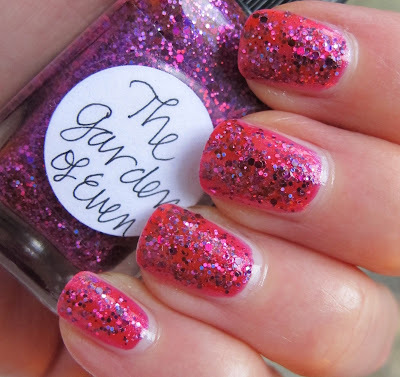 I also wore The Garden of Even over OPI Be A Dahlia, Won't You? for a few days. It looked lovely, but I slightly prefer the China Glaze Reggae to Riches base. Lynnderella herself suggests Verity Brilliant Violet for a base, so I'll probably pick that up eventually. 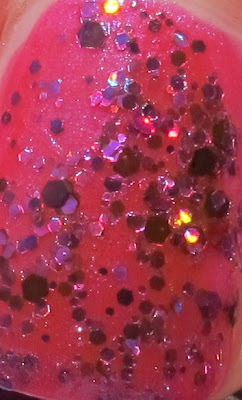 Lynnderella polishes are only available on her eBay store. Just a point of interest for you, the ladies I know who have purchased from the eBay store are raving about the fantastic customer service and communication. If you have any questions at all, don't hesitate to send Lynnderella a message on eBay. 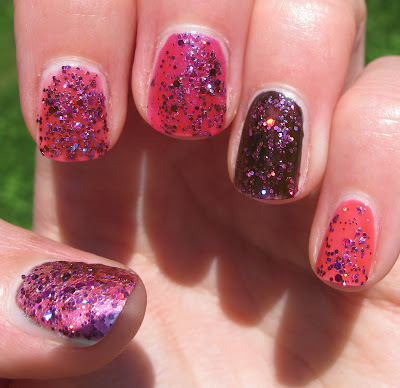 Also, don't forget my giveaway for Zoya Tracie and Zoya Myrta, ending on 8/11! Entering is super easy, so do it now! I love this combo on you, very lush!!! Thanks Renee! I wore it for a surprisingly long time (for me) and didn't want to take it off! *faint* This is gorgeous. I can't wait for my SSSS set to arrive! Ahhhh Jennifer, you will love them all!! I can't even possibly tell you which one of mine is my favorite! Enjoy!